My summer vacation just started, and man do I have a lot that I want to accomplish over the next nine weeks. I'm going to have to squeeze it between family visiting here and there, and Peanut Head has plans for outside work, which I need to be a part of. It's shaping up to be the busiest summer ever, and I'm excited about it. Early last month Peanut Head was out of town on business, so I decided to pack up the old dining room and start painting. This view is looking into the dining room from the office, which used to be the kitchen in the original house. 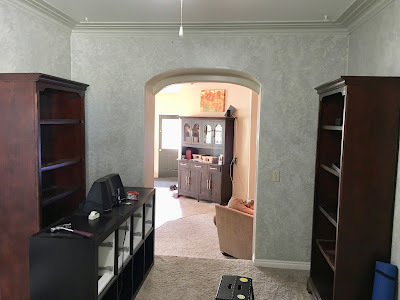 Due to the way the old dining room is situated, it is now a major traffic area to get from the old part of the house to the new part, so we are limited in the amount of furniture we can put in this room. Although I like the idea of having a ceiling fan in this room for general circulation, this particular ceiling fan is not doing the job. 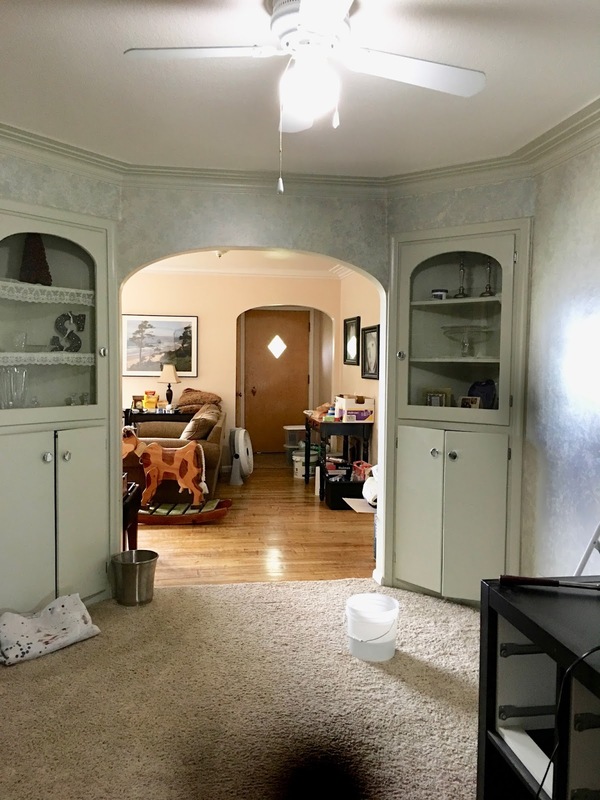 The light it provides is minimal, and it's a ceiling fan for a kids' room, so the plan is to replace it with a light fixture. I didn't think to take before pictures until I had already started packing up this room, so that's why everything is in such disarray. This is looking into the office, which isn't going to be touched just yet. 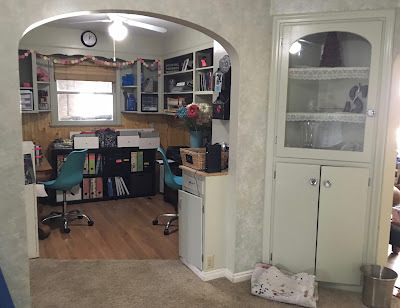 Can I just tell you how much I am itching to get started on this room though? I've been dreaming about it since we first looked at this house over a year ago. This view is looking down into the new part of the house. Do you see what I mean when I say that this is a major traffic area? This is one of the cupboard doors for the built in corner china hutches. I was a little astonished to find such a dark color underneath all the paint, but fads come and go, right? My plan was to fill holes and paint these cupboard doors a bright white. It took me an entire day just to get all of them sanded and prepped for painting. There were a lot of holes to fill, although I was careful not to fill the hinge holes as I've learned my lesson. The existing screws were stripped out though, so I did need to find new screws, paint them, and paint the hinges. You know I couldn't make the whole thing white though. What do you think? The color is Weathered Glass, which is a Valspar color (Lowe's). It's actually leftover paint from Annie's room in our last house. I loved it then, and I love it now. I think it's perfect for the inside of these cupboards. Peanut Head gave me a stern talking to about how we have "so much paint" and I need to use some of it before I start buying more. He didn't appreciate my eye rolling very much, but I'm trying to comply where I can. As long as it doesn't require decorating sacrifices. Where is my creepy smile emoticon?! I feel I need it constantly. I kept the lace that the previous owner of the house had inside the cabinet. When I took it out to paint I discovered it desperately needed washing. Dust! The lace makes me think of my great grandma, Nano, although she wasn't a particularly prissy person. She was quite the carpenter. And baker. And quilter. And she was known to let fly with the unacknowledged toot from time to time. Believe it or not, I don't have much to put inside these cupboards, that's why there's a bit of a mish mash of stuff inside. Less to dust though. I loathe dusting. The bottom cupboards are currently storing my paint. This isn't even all of it either. Just the stuff I'm currently using. I believe I mentioned already that there is more storage in this house than we can ever hope to need. It's a nice problem to have, but we must remain vigilant so that we don't start hoarding crap just because we can. These cute little knobs are my favorite part of the whole room. I found them at Hobby Lobby, and the screws were long enough to pole vault with, so Peanut Head and I had to cut them down to size. After painting the hallway a gray with too much blue, I settled on Sherwin-Williams' Repose Gray. It's more of a greige. I really like it. My intention is to use it throughout the house as my neutral color. I swoon over the crown moulding in the original part of this house. I don't even mind the tedious painting of it, I love it so much. Do you see that little cupboard sticking out on the right? It must have been part of the original cabinetry and countertop when this was the kitchen, but it's where we plug our Wi-Fi router in since it's a central location in the house. I swapped out the hardware as well. We still need to cut out an access hole to hide the cords. Right now they're a tangled mess. Can you tell that I painted the cupboard a darker gray? It's actually on the same paint strip as Repose Gray. It's called Dorian Gray. 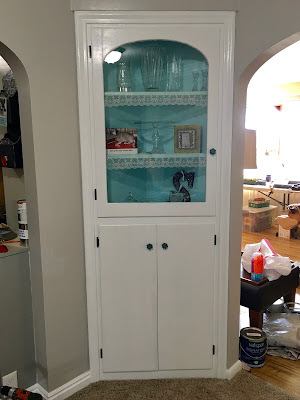 I also used this cabinet paint. It dries "harder" than regular paint so it will stand up to more intense wear and tear. I wanted to try it out because I have some cabinet projects coming up, so this was a good way to test it. I plan to use it on the shelving in the office. as well. 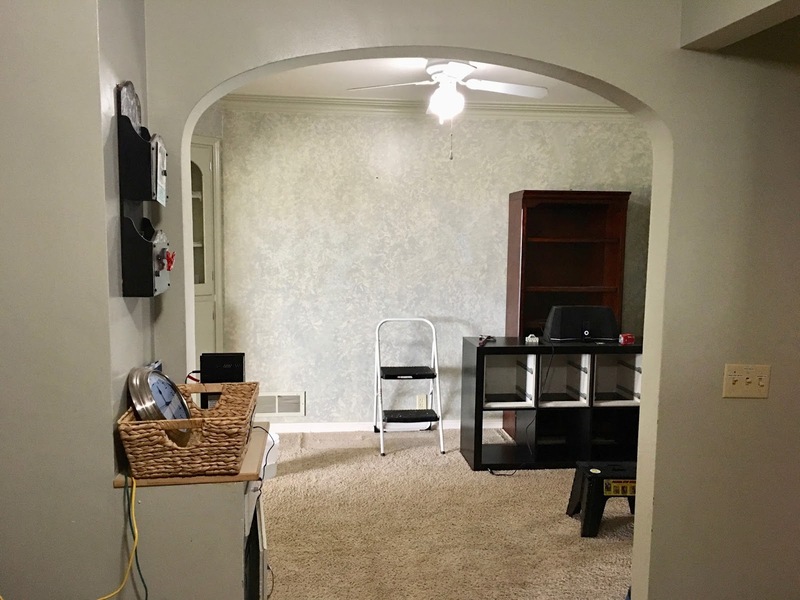 Since this room got a "refresh," I also cleaned the carpet. Although to be honest, it wasn't as bad as I expected it would be. Somewhere down the line we'd like to either go with the same darker carpet that we used in the girls' rooms, or go with a hardwood flooring to match the living room. That's waaaaay down the road though. We decided to move the desktop out here to make things less crowded in the office. I rather like it here. And finally, Peanut Head replaced the ceiling fan with a boobie light. There is so much more light in here now! I'm really loving it. And that's a wrap for the dining room. I'll be back soon to share our window coverings in the girls' bedrooms. We found a nifty idea on Pinterest that we're super excited about. Then after that, the next room to tackle is the office. I don't know how soon that will happen though because Peanut Head has outside plans for me. Whatever I do, it will have to be sneakily while he is at work. 😳 Because I'm passive aggressive like that.